Join us to learn more about overcoming Persistent Depressive Disorder! 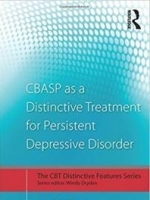 CBASP was developed specifically to treat the persistently depressed adult. CBASP has been identified by the Society of Clinical Psychology, Division 12 of the American Psychological Association as having Strong Evidence for the treatment of Persistent Depressive Disorders. Join us to discover more about this powerful psychotherapy system! Together we can help those living with persistent depression! All licensed clinicians (psychologists, psychiatrists, counselors, social workers, nurses, etc.) who treat chronically depressed patients may apply to the Certification Training Program. Clinicians interested in obtaining CBASP Certification are encouraged to contact a Certified CBASP Trainer in their area to learn about specific requirements. If you feel suicidal, there is help. National Suicide Prevention Lifeline: Call 1-800-273-8255 Available 24 hours every day. 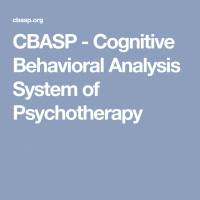 The Cognitive Behavioral Analysis System of Psychotherapy (CBASP) was developed specifically to treat the chronically or persistently depressed adult. 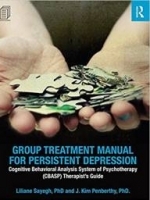 CBASP has been identified by the American Psychological Association as having Strong Evidence for the treatment of persistent depressive disorderand is the therapy of choice for persistently depressed patients in Europe, Canada and the USA. CBASP has been tested in the largest psychotherapy and medication clinical trial ever conducted in psychology and psychiatry and was found to be as effective as medication, and when combined with medicine it produced highly significant response to treatment rates. 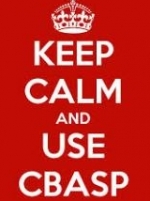 Research regarding CBASP is ongoing across the globe, with more evidence being compiled monthly, and more applications for the successful use of CBASP techniques. 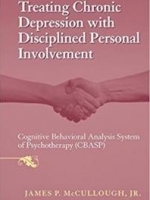 CBASP has been used very successfully with persistently depressed patients and is also promising in working with patients suffering from alcohol use disorders and persistent depression, as well as smokers who are persistently depressed. Further reading, education, and training is available to help clinicians learn how to administer CBASP and to train other clinicians in CBASP. 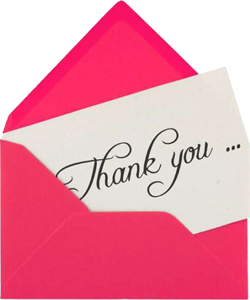 CBASP workshops, seminars, and research findings are regularly provided at annual conferences such as the American Psychological Association Annual Convention, the American Psychiatric Association Annual meeting, the Assocation for Behavioral and Cognitive Therapies, the Anxiety and Depression Association of American, The European Association for Cognitive and Behavioural Therapies, the British Association for Behavioural and Cognitive Psychotherapies, to name a few. We also hold formal training workshops to certify professionals in CBASP and in how to train others in CBASP. Our goal is to train providers in CBASP so that they can continue to conduct research, disseminate findings and help people suffering from persistent depression and related disorders! There are over 20 million persistently depressed adults in the U.S., and many million more worldwide, whose treatment expenses and costs to industry in terms of lowered work productivity and absenteeism exceed $40 billion annually in the U.S. This figure does not take into account the human suffering, social problems, financial depletion, discord in the marriage and family, as well as lowered quality of life that negatively impacts this patient population and their loved ones. Approximately 90% of individuals with persistent depressive disorder will experience Major Depressive Disorder in their lifetime. Left untreated, it is rare that this kind of depression will go away or improve on its own. Persistent Depressive Disorder keeps people stuck in the same patterns of thinking about themselves, the world around them, and the future, which over time becomes ingrained. The DSM-5, has combined mild but long-lasting depression (dysthymia), and more severe and long-lasting depression (chronic depression) into: Persistent Depressive Disorder. DSM-5 and ICD-10 revisions recognize the persistent psychosocial suffering that these conditions cause depressed patients. We are a global community of clinicians, healthcare providers, researchers and students who strive to better understand depression and help those who suffer from it. We welcome all who are interested in helping those who suffer from chronic or peristent depression! Please join us in our work! Certification Training is designed to assure a level of skill equivalent to Dr. McCullough’s conceptualization of CBASP. This includes the administration of three techniques: Situational Analyses (SA) to highlight the consequences of behavior, the Interpersonal Discrimination Exercise (IDE) to ameliorate personal traumas, and the Contingent Personal Responsibility (CPR) to modify maladaptive in-session behavior. The Training Program is modeled on Dr. McCullough’s work with training CBASP therapists. Certification Training will be personally tailored to each individual and will be conducted one-on-one. 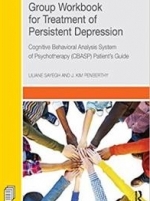 James P. McCullough Jr., Ph.D., spent decades developing the Cognitive Behavioral Analysis System of Psychotherapy, or CBASP, to treat persistently depressed patients. Persistently depressed individuals are those who have been continuously depressed for two or more years. Seventy-five percent have been depressed since mid-adolescence. 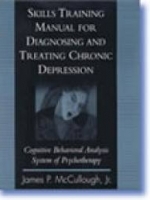 When combined with medication, CBASP therapy has been shown to be 85 percent effective in treating chronic depression for patients who complete treatment.A 2000 article in the New England Journal of Medicine reported the effectiveness of CBASP based on the results of a study of 681 chronically depressed outpatients who completed a randomized clinical trial at 12 medical sites in the United States. 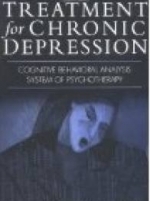 McCullough also published his first CBASP textbook in 2000, “Treatment for Chronic Depression: Cognitive Behavioral Analysis System of Psychotherapy.” He continues to be engaged in research, dissemination and training in CBASP as an Emeritus Professor of Psychology and Psychiatry at the Virginia Commonwealth University in Richmond, Virginia, USA. © CBASP SOCIETY 2017. All Rights Reserved. Administration | WebMail | Website By: SayItOnTheWeb, Inc.